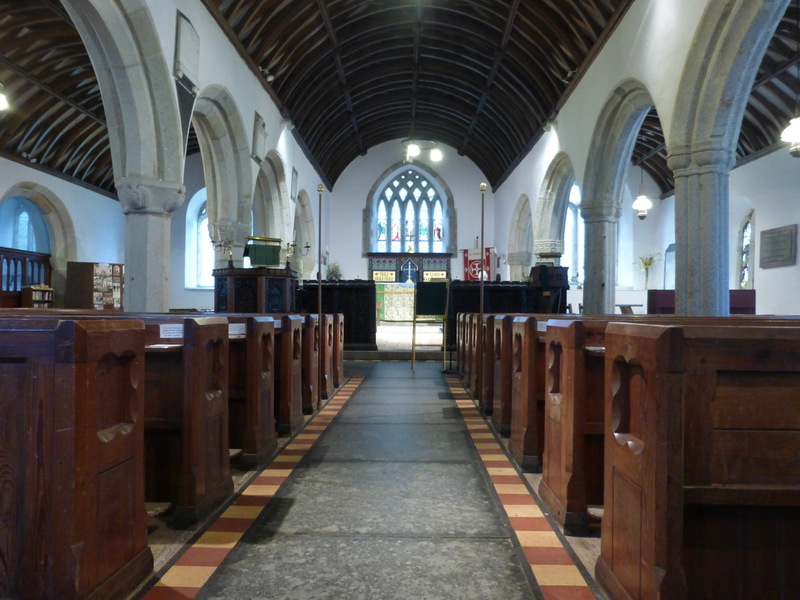 St Winnear (St Winierus or Fingar) is a fine-looking C15 church. Its development has left it slightly lop-sided. The nave and north aisle are of equal length while the south aisle is foreshortened at the west end and an additional short aisle – the Arundell chapel – has been added on the north side. The result is a church almost as wide as it is long. First impressions are of the pinnacled tower with its little turret stair. The main entrance is at the north and has a Tudor surround to the main door with an additional small side door to allow the Arundells easy access direct into their chapel. Inside, the church is light and airy with some impressive long uninterrupted roofs, C19 but reflecting the original wagon roofs quite elegantly. The capitals to the pillars vary. Those on the north side have some charming carvings of angels while those on the south side are of simple foliage. The capitals to the Arundell chapel – now, sadly a vestry/dumping ground – have angels holding shields with one having a happy Arundell stag. 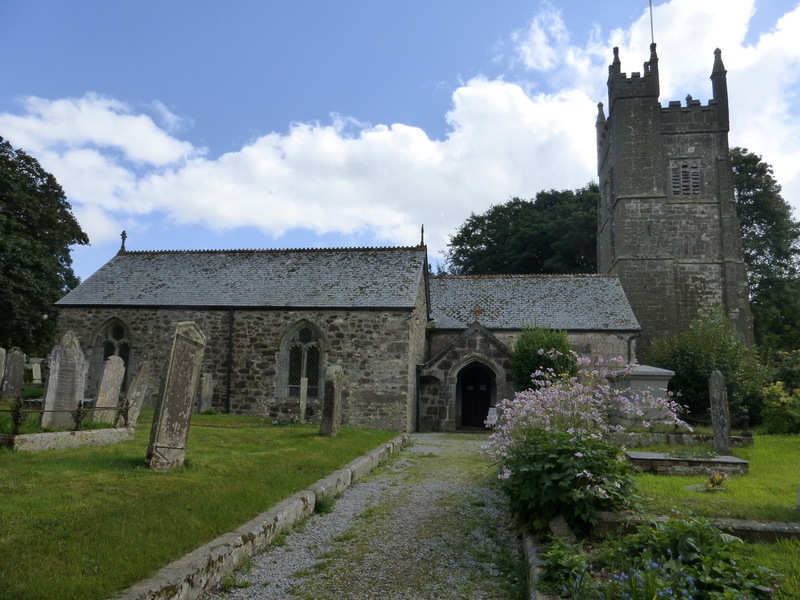 The major restoration was carried out by the wonderfully-named Hingerston Randulph. He seems to have avoided the temptation to install a new rood screen, leaving the lower half in place. This survived the Reformation by not having figures on it but, cut to half its height, is rather out of proportion, hiding the choir. His altar reredos has the usual Victorian collection of gilt, quatrefoils and uplifting words which jar with current tastes (ie ours). The best feature is the beautifully simple altar in the south aisle which is dedicated to a former vicar. Without the ‘benefit’ of Victorian glass, this chapel is light and has none of the high altar’s pretensions. 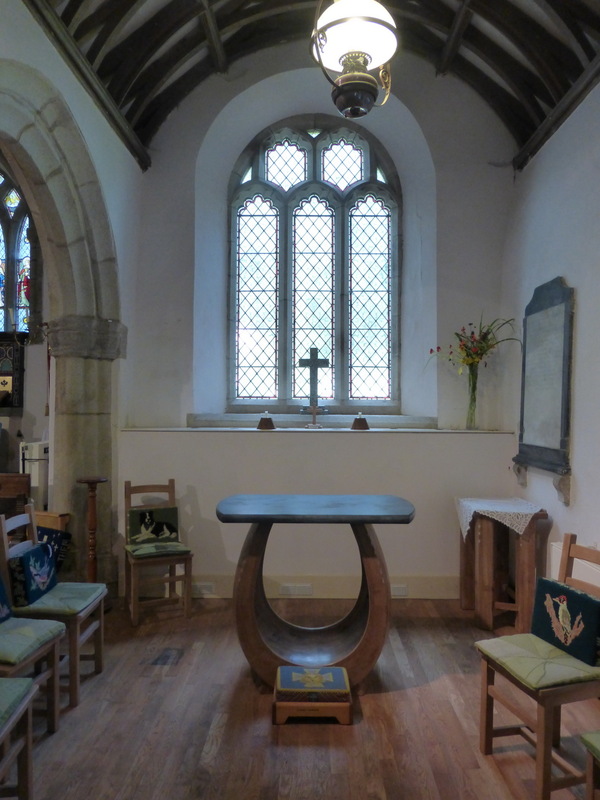 The shape of the altar hints at a variety of things such as cupped hands or a boat. We just wanted to put a small child in its embrace. There were originally two doors on the south side, both blocked up. One faced the northern main entrance. The other was at the extreme south east corner, nearest to the rather grand looking vicarage which is reached from the churchyard by a splendid ogive-arched gateway. The is no trace of this second door on the inside of the church. There are a series of crosses in the churchyard. The best is the C10 Polmenor cross which is by the path to the porch. 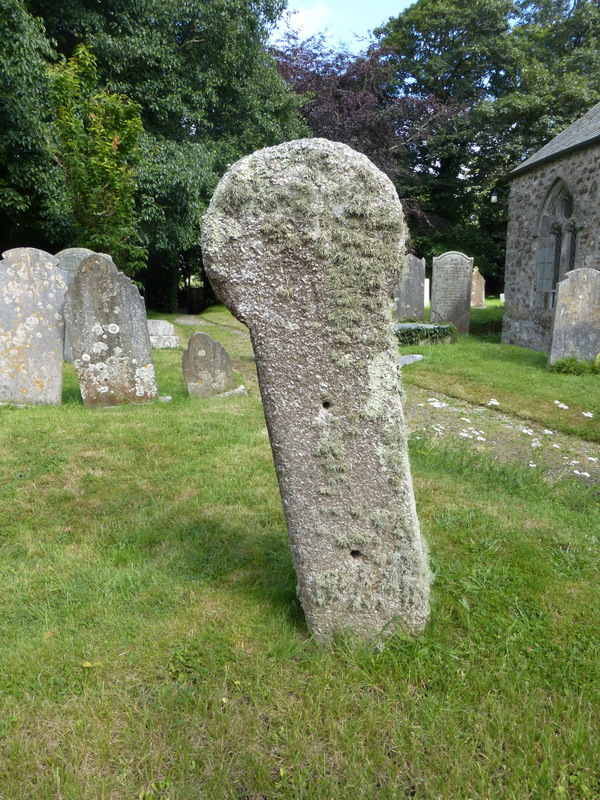 This bears a faint figure of Christ and was obviously used as a gatepost at some point for it has two large holes in it. There is another, shorter cross with a figure of Christ and a cross-head with a Latin cross which rests in the grass. 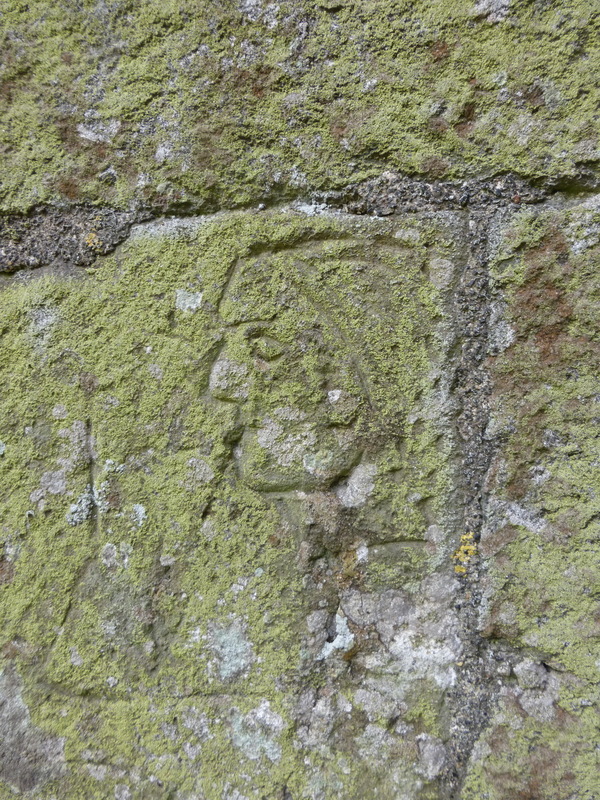 On the outside of the tower is rather charming scratched image of a head. This is described as a mason’s mark but, to our eye, is a simple graffito. It is known as the ‘red indian’. On the outside of the tower are two decayed grotesques of happiness and sadness: or perhaps tragedy and comedy. A short distance away is a fine building which may once have been a detached vestry but now appears to be in the grounds of the vicarage.